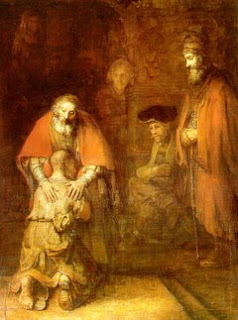 We are all the prodigal son. There is not one of us that is without sin and therefore there is not one of us who has at one time or another not been separated from the Father. But so often we take on the air of the older brother in relation to those in the body of Christ around us. We assume that since we have given longer years of service or have not been lost in the same manner that we are due a greater pleasure or service from God. When we enter into this mindset we lose sight of the Spirit of grace. Grace is that which affords joy, pleasure, delight, sweetness, charm, and loveliness; to have favor, elegance, and acceptance. The bitterness of the older brother ran so deep he would not even recognize the prodigal son as his brother. Do we do this? Do we acknowledge some fellow believers as children of the Father but fail to accept them as our brothers and sisters, harboring instead resentment and jealousy? I see this attitude a lot in the organized church – the spirit of eliteness. It is nothing other than pride and is a foul and evil spirit. Romans 5:20 tells us that “where sin increased, grace increased all the more.” Grace can be measured in the distance covered in the return to the Father. The passage goes on to explain that this does not mean we continue in sin. But where sin has been dealt with and forgiven it is not our job to dig it back up. This is also a result of an evil spirit. The Holy Spirit is a spirit of conviction, not of guilt. Conviction leads to repentance but there is no place in God’s family for guilt. We have all experienced grace and should take joy with our fellow brothers and sisters when they too can experience and partake of the grace of God. Acts 20:32 defines words of grace as words which build up and give an inheritance. Instead of being selfish with our inheritance let us share in the inheritance by building each other up. This is the true Spirit of Grace and a spirit we should all desire greatly to have in our lives. The next time you find yourself wanting to bite with words that hurt and question the validity of a brother or sister’s experience with grace, remember your spirit of grace – it is the most valuable gift God has given anyone, and it is meant to be shared. We are all prodigal sons. There is no one who is self-righteous. Jesus came to us in grace and truth. We should aspire to be full of grace and truth as well. i always thought unconditional love was what everyone needed and deserved, and not only this, but that this was the way of god and how to share his love and my love for him. this was the way to heal the world, the pain and the hate, under god. i still find it hard to think any differently. but just like children are victims in this world because of their unconditional love, so can be all people who love unconditionally. who give all trust and everything they have under god — love. because, unfortunately we must admit, no matter what we do and how much love we give, some people desire everything a person has and is, and will hunt it, and steal it by any means, perhaps forever. jesus also said that many would call his name and claim to know him, when he did not know them. so, how do we know them from our brothers and sisters? do we need to? we are supposed to love everyone…for this is how the world will know the followers of christ, by their love for their neighbors. but perhaps there is something to be said for this advice of jesus: do not throw your pearls to the pigs. therefore, we should also be cautious in our love, and not give away everything righteous and gentle and kind we have. share our faith, but not give it away because of our love for the person who desires what we have and are. accept others as our brothers and sisters without judgment, but do not turn a blind eye to evil simply because they claim to be our brother or sister. be a brother, be a sister, share our faith, but never forget to live in the faith of the lord first, so we may know when love is being returned, and when it’s not. and where there is love, love, and where there is not, love more, but keep our pearls close. so the children of god will love like children, humble and without judgment, but remember that god is our father, he whom we should give our unconditional love, and he, and only he can know our true brothers and sisters, and ourselves. let us trust in god, when we share our love with all people, and share our faith, brother, sister, friend or foe. still, i have to wonder, what is grace? is grace loving in the face of love, or loving in the face of hate? is it loving in the face of abuse, or loving enough to stop it? is it loving our brothers and sisters, or loving our neighbors without knowing or caring if they are our brothers and sisters or not? is it living like we think we are told by the bible, or is it living in our faith and as our hearts tell us, as best as we can in god’s shoes? is it loving god before all else, or is it love in the name of god, loving like god in our hearts? is it knowing the truth, searching for the truth, or is it trusting the truth in god? truly, i do not know, but i would think it is all these things and more. can it even be summed up, grace? i think there is so much focus on loving god with all our heart, mind, and soul that we end up just loving to love. and then all love is lost. how can we love when we don’t even know what love is? perhaps this is grace. sin or no sin, whatever you believe, perhaps grace is being able to live as yourself, for truly we have nothing, but are only what god made us.